Archive for the Category "Paris Attractions"
As Europe’s cultural capital, Paris has been a magnet for visitors, artists, painters and writers. Paris attractions are many indeed, and there’s always something for everybody. The usual places to visit in Paris include the Eiffel Tour, the Louvre, the Notre Dame Cathedral, the Arc de Triomphe, the Champs-Elysees and so on. 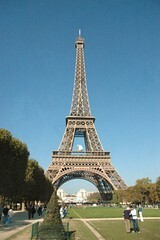 There are many operators who offer Paris sightseeing tours that cover all these great tourist attractions.